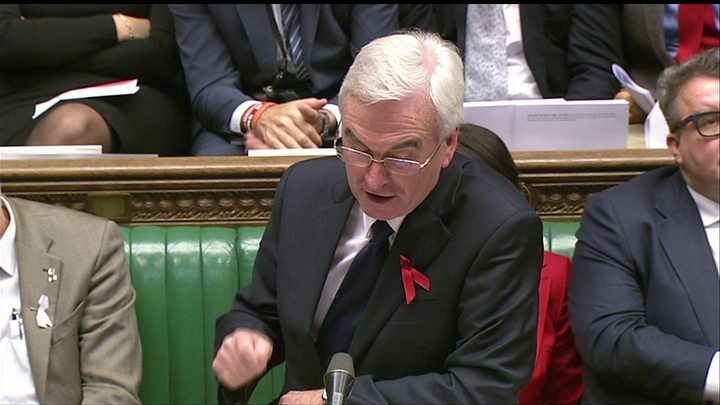 Media captionThe moment John McDonnell pulled out Mao's "Little Red Book"
Shadow chancellor John McDonnell accused George Osborne of "sheer economic illiteracy" in a Spending Review speech that also saw him quote Chairman Mao to the chancellor. Mr McDonnell produced a copy of the Chinese Communist leader's Little Red Book after claiming public assets were being sold to the Chinese government. He also attacked austerity and claimed a Labour victory over police cuts. Mr Osborne said Labour was a "deadly threat to the economy". The chancellor shelved planned cuts to tax credits and pledged to protect police budgets in his Autumn Statement and Spending Review, using a windfall from healthier-than-expected public finances. In the Spending Review documents it was also revealed funding for opposition political parties would be slashed - a move that could cost Labour more than £1m a year. In his biggest Commons speech since becoming shadow chancellor, Mr McDonnell said the government had missed its deficit reduction targets and described the tax credits U-turn as a "fiasco". He said: "At the same time as the chancellor was planning to cut tax credits to working families, he cut inheritance taxes for some of the wealthiest families in this country." He said the chancellor had said austerity would only last for five years, and that people would "feel absolutely betrayed" by more spending cuts. "There's only so long you can blame past governments, there's no more excuses for this chancellor after five years," he said, also warning of a "massive winter crisis" in the NHS. After referring to the UK's relationship with the Chinese government, Mr McDonnell said: "To assist Comrade Osborne about dealing with his new-found comrades, I have brought him along Mao's Little Red Book." After Speaker John Bercow intervened to calm the Conservative benches, the shadow chancellor read a quote from the book: "We must learn to do economic work from all who know how. "No matter who they are, we must esteem them as teachers, learning from them respectfully and conscientiously. But we must not pretend to know what we do not know". Throwing the book across the Commons table towards Mr Osborne, he added: "I thought it would come in handy for you in your new relationship." Picking it up, the chancellor said it was Mr McDonnell's "personal signed copy". Afterwards, Labour's shadow chief secretary to the Treasury Seema Malhotra told BBC News Mr McDonnell had been highlighting the fact that "George Osborne should not be selling off our assets to foreign governments when he won't invest in this country himself." Former shadow business secretary Chuka Umunna said: "I haven't quoted a Communist before and I have no intention of doing so in the future," while Labour MP Frank Field said it was important to realise jokes in the Commons would be seen differently outside the chamber. Chris Leslie, Mr McDonnell's predecessor as shadow chancellor, said brandishing the book had been a "misjudged stunt". "I don't think it achieved quite what John wanted it to achieve, but John can explain the joke to people who might not have got the joke," he added. Mr McDonnell told BBC News: "What the chancellor is doing is selling off at least £5bn worth of our own assets, owned by the British people." He said he had been trying to make an important point, adding: "If you can do it through humour and draw attention to it, so much the more effective." Meanwhile, Labour reacted angrily to the government's plans to cut "Short money" paid to opposition parties to help fund their Parliamentary activities. To qualify for Short money, a party must have at least two MPs or one MP and more than 150,000 votes. Under the formula for allocating it, Labour is in line to get at least £6.2m a year this Parliament. But the Treasury plans to cut it by 19%, then freeze it for the rest of the Parliament, as part of attempts to "reduce the cost of politics". A Labour spokeswoman said it was an "anti-democratic move" by the Conservatives, accusing the government of "partisan moves to hit their opposition and give themselves another unfair advantage".